We all dream of having the sort of garden that graces the cover of home improvement magazines, but the cost of all those plants and accessories can really build up. With Gardening Direct vouchers you can get the garden you've always wanted without breaking the bank. So whether you've got a roof terrace that needs brightening up or a whole back garden to content with, a Gardening Direct voucher code will save you money while you shop. Launched in 1996, Gardening Direct was initially established as a mail order service supplying gardens around the country with live plants for their garden. Later establishing itself as a premium online destinations for plants and gardening supplies, Gardening Direct now provides over 1 million customers with everything they need to get their gardens in bloom. Gardening Direct is committed to offering its customers the very best service available, combining genuine convenience with low prices, value for money and consistently high quality plants from around the world. So whether you're just getting started in gardening or looking to grow and expand your existing garden, Gardening Direct is the place to come for the very best deals around. At Gardening Direct customers can browse a wide range of plants, all grown under greenhouse conditions to the very highest standards. Want to get the most for your money? Their small plug plants are 4-8cm tall plants sold in a plug of comport and represent the best value for money for the keen gardener. Or perhaps you want to add to your garden but don't have much time to dedicate to tending your plants? Their large plants are supplied a full 7-11cm tall and can be planted directly into your garden – ideal for those that want the best results in the fastest time. Gardening Direct sell over 130 million plants every year, and stock everything from old favourites to rare varieties that you seldom find in garden centres – so they really can help you build the garden you've always dreamed of. All plants are carefully packaged into sturdy boxes equipped with special tabs designed to hold them in place during transit, ensuring that your order will arrive at its destination fit, healthy and ready to grace your garden. And with free delivery to anywhere within the UK and Northern Ireland, Gardening Direct really is a fantastic and convenient alternative to your local garden centre. 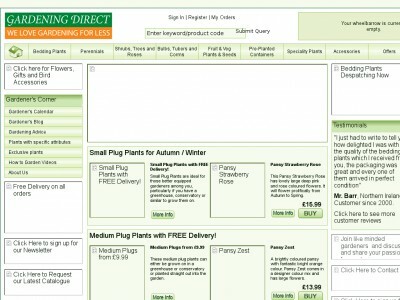 Want to get shopping with Gardening Direct? With Gardening Direct vouchers you can enjoy fantastic savings while you shop. Whether you want a ready-grown plant to give your garden an instant makeover or seeds and seedlings to grow from scratch, a Gardening Direct voucher code will get your garden looking great. Sells more than 130 million plants every year. Browse our website until you find the Gardening Direct vouchers that are right for you, then navigate to their website to begin shopping. Click on a product for more information, then click 'buy' to purchase. Enter your email address and click 'Continue to checkout'. Enter your address details and click 'Continue to checkout'. Enter your Gardening Direct voucher code in the box provided and click 'Add vouchers'. Want to find out more about gardening and planting with Gardening Direct? Why not pay a visit to the company's dedicated YouTube channel? You'll find lots of informative how-do videos detailing how to get the most out of your plants as well as video features, promotions and more. You can also use this channel to find out more about saving money with a Gardening Direct voucher code. If you've enjoyed shopping for plants and accessories with Gardening Direct, you might enjoy browsing more ways to improve your home both inside and out with stores like B&Q and Made. Or, if those aren't up your street, you'll find plenty more to explore in our Home and Garden section. Obviously, it's not only Coblands which offers valid coupons in Home & Garden category. couporando.co.uk also gives you access to many more voucher codes and online stores rabates. Redeen them at Plant Me Now, Van Meuwen . Enter your Gardening Direct vouchers in the box provided and click 'Add vouchers'. Enter your payment details and click 'Complete order'. Standard UK delivery is free on all orders. If you need to return a product for any reason to Gardening Direct, you can do so by simply contacting the company within 28 days of receipt to arrange a replacement or refund. Need to contact the team at Gardening Direct? Whether you have a question about your order, want some tips from the gardening experts or just want to find out how you could save with Gardening Direct vouchers, you can contact the Customer Services department by accessing the online contact form here. Want to find out more about Gardening Direct? Why not follow the company across your favourite social media networks? You'll find lots of exclusive content including gardening hints and tips, special offers, competitions and more. You can also use these pages to find out more about saving money with Gardening Direct voucher codes. Don’t forget to check them regularly, as you can never be sure when free Gardening Direct vouchers might be waiting for you! Buy now online at www.gardeningdirect.co.uk. I find gardening really relaxing, but can't say the same about high street prices! That's why I always use a Gardening Direct voucher code to buy my gardening supplies from gardeningdirect.co.uk. Whether you want some new perennials or a rose bush in full bloom, you can get great deals with Gardening Direct vouchers. I've just finished planting my front and back gardens, and I made huge savings thanks to my Gardening Direct discount code. So if you like to exercise your green fingers without breaking the bank, check out the latest Gardening Direct voucher codes.